This variation of the ever popular and successful John Storey has a tail added to give it extra flotation. John Storey was a river keeper in North Yorkshire in the mid-1800s for the Ryedale Anglers' Club. Tail : Natural red game. Body : Plain bronze Peacock herl. Hackle : Natural dark red game. Wing: : Tip from a speckled mallard breast feather, tied in front of hackle and pointing forward over the eye. As with many fly patterns tiers over many decades make personal adaptions such as the addition of a tail and ribbing. The original wet fly dressing had an under body of fawn wool, to better absorb water, and mallard wing fibres sloped back over the peacock herl covered body. 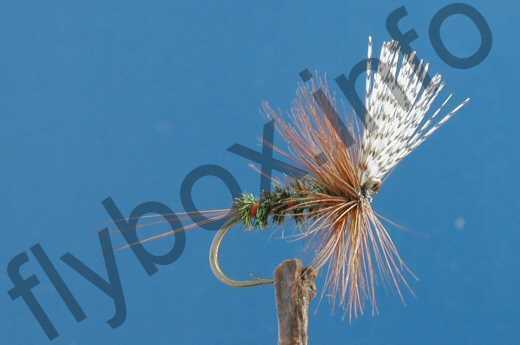 Currently there are no comments about the John Storey (with tail) fly pattern from other fly fishermen yet.